"Being There," colored pencil work by Diane K. Southen took 1st Place in the 2D category in 2017. ARTISTS! Download 2018 prospectus HERE. Co-hosted by Blue Ridge Community College, Bring Us Your Best is held in the Blue Ridge Conference Hall every August. 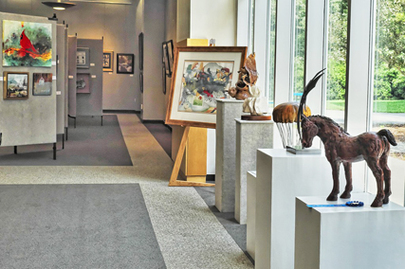 Now in its 15th year, this popular juried and judged exhibit continues to grow by appealing to wider audiences each year. Exhibiting artwork from more than 100 visual artists each year, the show and the opening awards reception is free and open to the public. All work is for sale. "Walela: Spirit Guide," by Bonnie Joy Bardos, won the One Planet / One World Award sponsored by the Unitarian Universalist Fellowship of Hendersonville in 2017. 1st Place, for each category (4)....$250 ea. 2nd Place for each category (4)...$150 ea. 3rd Place for each category (4)...$100 ea. Matt Smith from The Starving Artist Art Supply and Framing Shop presents Barbara Zimmerman with the 2017 People's Choice Award. "Season of Joy," paper landscape by Barbara Zimmerman. Winner of the People's Choice Award in 2017.